The Colloquy meets biennially at venues by tradition alternating between Europe and North America. 27th Polar Libraries Colloquy, June 10-June 16, 2018, Rovaniemi, Finland. 26th Polar Libraries Colloquy, July 10-July 15, 2016, Fairbanks, United States. 25th Polar Libraries Colloquy, June 29-July 3, 2014, Cambridge, United Kingdom. 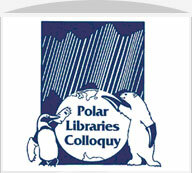 24th Polar Libraries Colloquy, June 11-14, 2012, Boulder, United States. 23rd Polar Libraries Colloquy, June 13-18, 2010, Bremerhaven, Germany. 22nd Polar Libraries Colloquy, June 2 – 6, 2008, Edmonton, Canada. Currents of Change – The Future of Polar Information. The Colloquy was hosted jointly by the Canadian Circumpolar Institute and the University of Alberta Libraries. It was held in conjunction with the 2008 meeting of the University of the Arctic Council. Polar Research: Let Us Share – Amiqqaaluta. Poles apart – Poles On-Line.